Sometimes what you want is a good, solid keyboard without the high-end price. The Rosewill RK-8100 is the one. It features a cutting edge design. Unique software designed for gaming and soft-touch gaming keys enable wonderful gaming experience. Fully programmable keys are offered and 10-profile setting is supported. You can also press 18 keys at the same time. Born for gaming The Rosewill RK-8100 is a gaming keyboard with soft-touch gaming keys. The included software is designed for gaming. 18-key rollover function 18-key rollover function supports 18 keys pressed at the same time. 19.09" x 8.35" x 0.98"
Cons: The gaming keys are rubbery and prevents me from typing quickly due to the textures varying across the keyboard. Pros: Been using this for 2 years now and really enjoy it. Other Thoughts: Would recommend if you're looking for a cheap but useful keyboard for gaming. Pros: Its good for the price. Been using it for about 2 years now and haven't had any problems. Pros: Cheap and works great even over a year later. Cons: There is a Power button on the keyboard. I can't count how many times I have accidentally hit this stupid button. Other Thoughts: For future reference, do NOT put a power button on a keyboard. It is way too easy to accidentally power off your computer. And I don't know what kind of switches or arguments they put with their shut down command, but it is the next best thing to unplugging the PC. No warnings, no chance to save any open work....it is shutting down NOW. 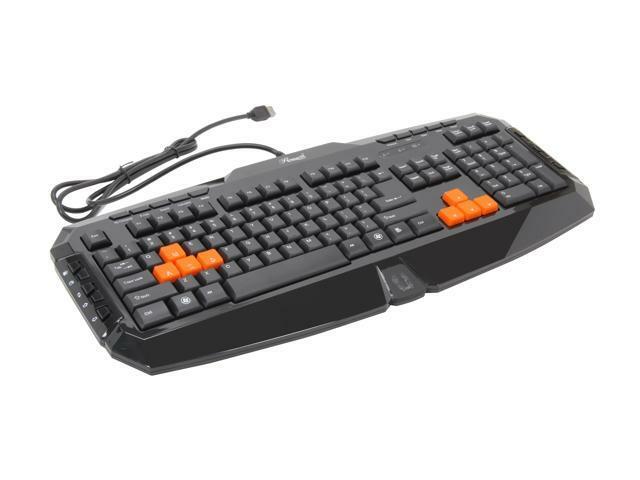 Pros: Excellent gaming keyboard at an affordable price! Cons: After about 7 months of usage, the usb cable is beginning to act up. The keyboard rarely gets recognized by my PC, and I've tried various USB ports. I end up having to tinker around with the usb cable until it finally gets recognized. I think its a poor design with the usb cable itself especially if you're looping it and connecting it to a PC at an angle. Other Thoughts: Redesign the usb cable connection so its not as finicky. Pros: Profile- I like the way that the keyboard is shaped and laid out, and the cord feels heavy duty. Cons: That enter key- I know I should have looked closer at the time of purchase, but the old school enter key that takes up the space where the \ goes is a nightmare for anyone how uses \\, why is that necessary? Plastic / rubber quality- No big surprise that the plastic is super thin, and the rubber keys are pretty horrible as far as feel goes. Other Thoughts: I didn't like this keyboard mainly because of the enter key. But aside from that oversight, I think you can find a better quality keyboard at this price range. I wouldn't call this a gaming quality keyboard aside from the looks. Thanks for the feedback. We will pass it along to our QA and Design teams for further investigation.